1000 miles. And also a million…. This time last week we spent 14 hours driving almost from one end of the country to the other. As the ferry approached Mallaig, the mainland port the skies opened with a downpour of rain which had been rolling towards us across the sea for most of the journey, while on the mainland the sun shone. 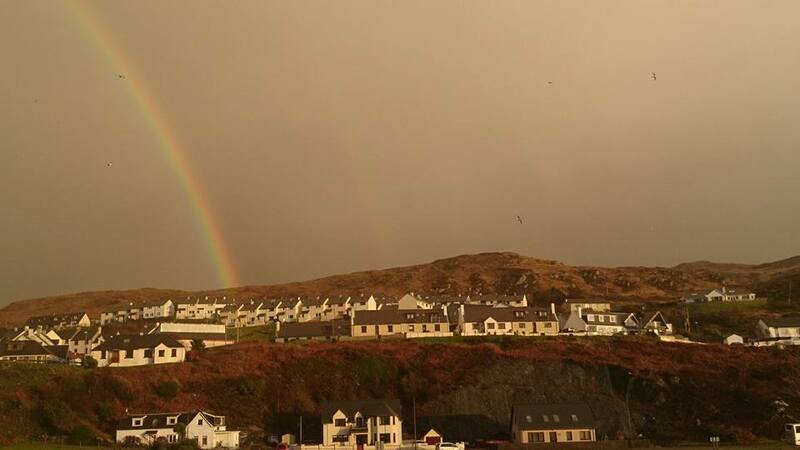 A stunning rainbow, over a sea of houses. It all felt rather symbolic. 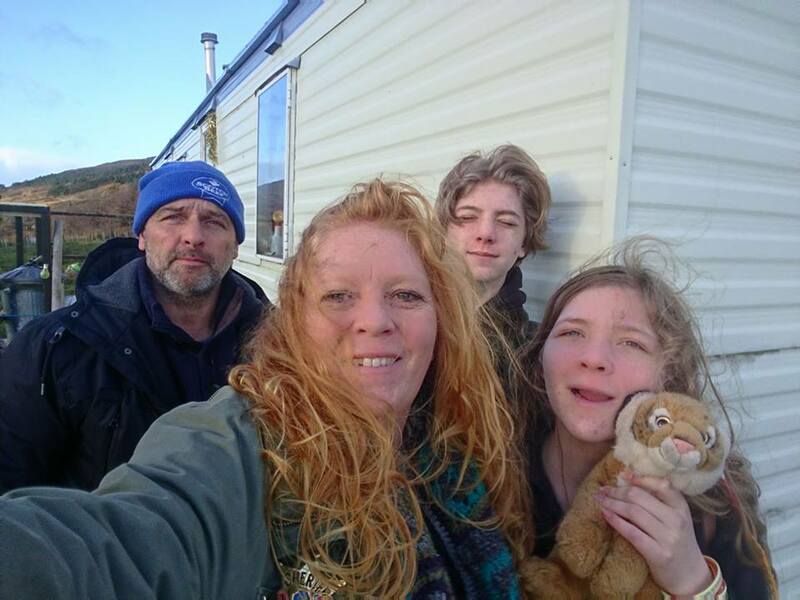 We were only travelling 50 miles along the road on that first night, to Fort William which was less than would have been sensible, given the length of the total journey but necessary as we all had dental check ups and Scarlett had a brace progess check up the following day. 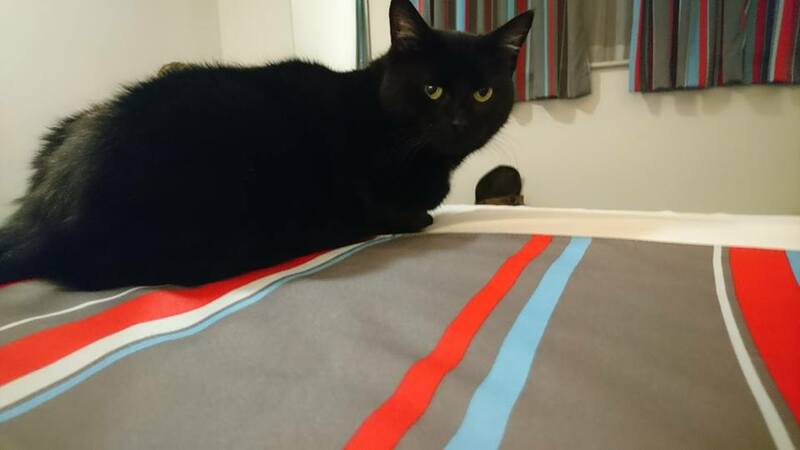 Bonnie also did very well with all the travelling but she was at least able to have regular ‘get out the car for a wee’ stops along the way whereas Kira was in her cat carrier for the duration. The early stop did mean a meal out for Ady and I (Davies and Scarlett were much happier with fast food in the hotel room, served with a side order of hotel wifi and TV) and a bonus beer with a Rum friend who we had not said a proper goodbye to as he was off the island looking after his poorly Mum who happens to live in Fort William. Then to Friday. There were moments in that epic 14 hour drive south for the winter, cat in carrier mostly quiet and still but occasionally with a pitiful meow, dog curled across my feet bringing on pins and needles, a 50 mile diversion with some mis-read signage meaning it became nearly 100 miles diversion, it already being dark before we hit the sign telling us we’d reached England, the oil light pinging on about 80 miles from our final destination, when it felt like David Attenborough should be voice-overing the trip. I know birds migrate for days on end to head south but surely in people years that was days on end? It certainly spanned two days as it was the early hours of Saturday when we finally pulled up at my parents house in Sussex. 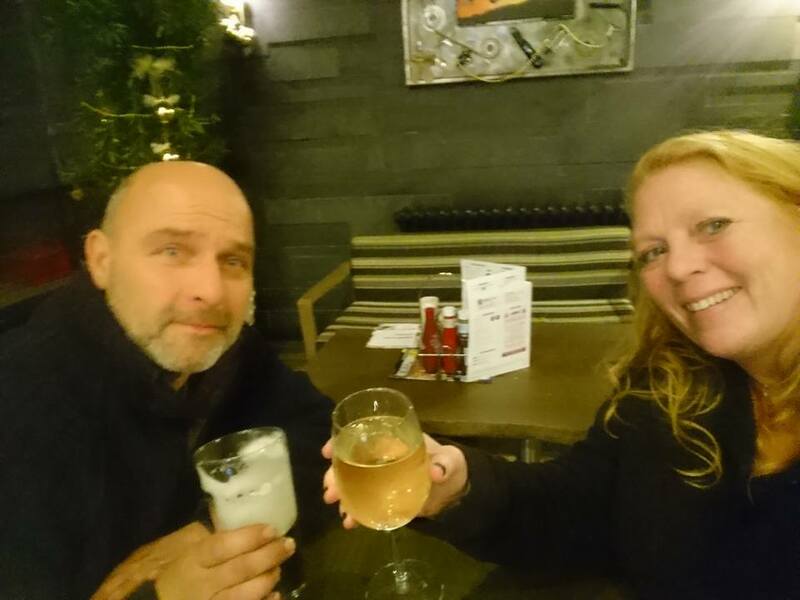 Which meant that settling in the cat and dog, having some food and catching up even in brief with my Mum and Dad took us to a very late bed time indeed. Saturday and Sunday was rather a blur of dog walks, supermarket trips, spending time with my parents, my brother and his family and a speedy trip to our old house to check on an overgrown hedge intruding onto the neighbours garage. It was odd to see the house (which we still own, hence checking up on it) and not feel any pull to it – it’s just somewhere that we used to live. 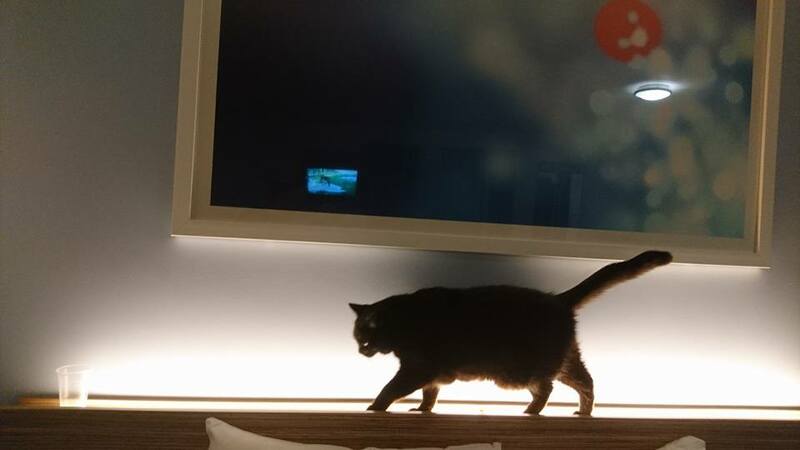 On Saturday morning I was woken by unfamiliar sounds including an emergency services vehicle with siren blaring as it drove by. I counted 12 sirens over the course of that first day. A sound never, ever heard on Rum but as much of a soundtrack to life in that house – where I lived from ages 4 to 19 – as the cockerels crowing to announce morning, cuckoos calling to herald spring and stags roaring to signify autumn are the background noise on Rum. On Monday we headed west, driving past Stone Henge and arriving in Glastonbury in the early afternoon. I feel as though Glastonbury and our planned time here is worthy of a post all of it’s own and frankly the first leg of the trip away from Rum was exhausting enough that just recounting it in a blog post has me feeling tired again. So we’ve landed. Back on the mainland, starting to remember things and slowly take stock of where we are, where we want to be and how we might get there. We knew this would be a lot to take in and we were most definitely right. Just two full days and three sleeps till the off. 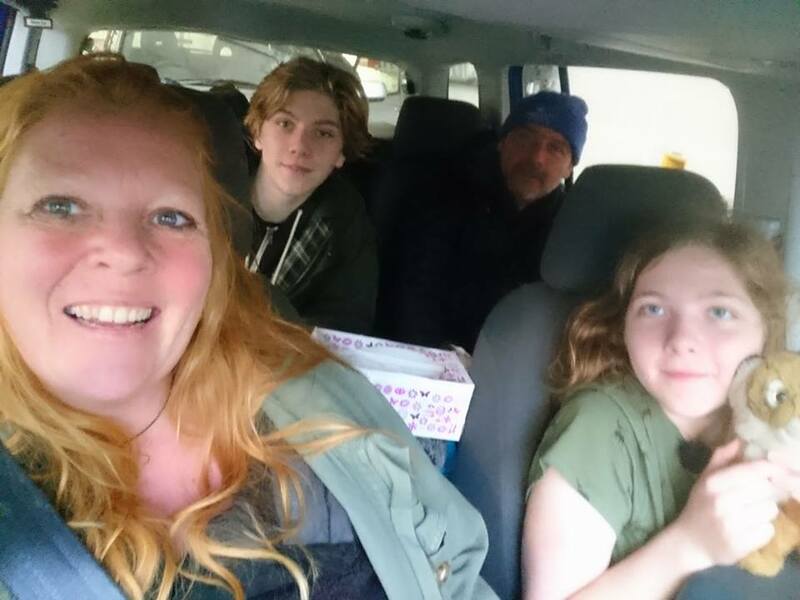 It’s tricky to know what to bring and what to leave, what we might need, what we might regret not bringing and what we may end up looking at in weeks to come and wondering why we gave it car space. Four people, a dog, a cat, a full size keyboard, a ukulele, Open University study materials for two, clothes and shoes…precious things, useful things, just in case things. Some are easy decisions – the clock stays, despite it probably being my most treasured possession it only hangs on the wall when I consider myself at home. Everywhere we’ve planned to be so far is not going to be home. I won’t be needing my jam funnel….craft materials will be useful for making Christmas gifts, most of our Rum suitable clothes are cheaply and easily replaced with more mainland worthy garments once we arrive on the mainland. We’ve had our ‘See You In The Spring’ party in the Rum village hall, inviting the community and various visitors to the island who happened to be around last weekend to come and cram a full seasons worth of celebrating into one evening with us as we’ll miss Christmas, Hogmanay, Burns Night and everything inbetween. 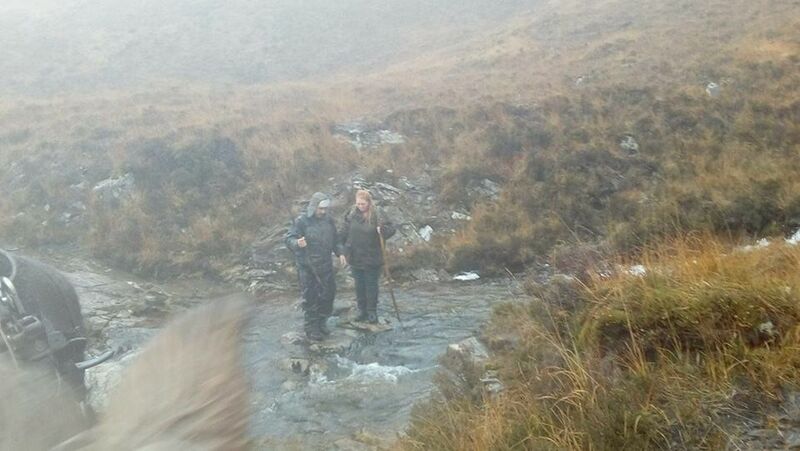 There was singing, laughter and a very Croft 3 pork heavy menu. The caravan is pretty much packed up as far as anything we want to bring with us goes. 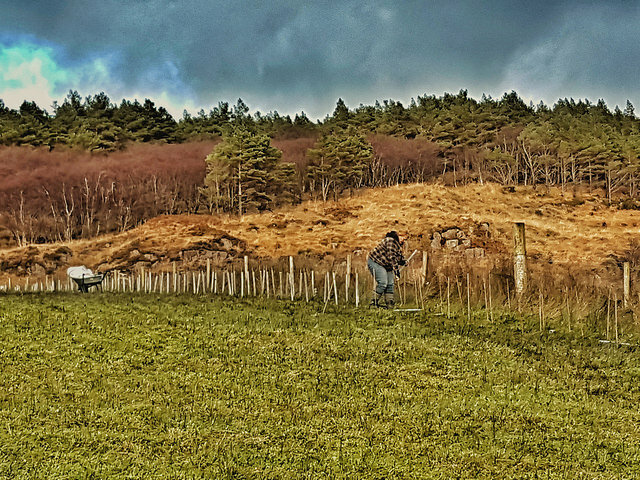 Tomorrow we have various outside on the croft tasks to tend to, Wednesday we will be packing up the car ready to head off on Thursday. It’s exciting and real now and already plans are starting to get lined up for things to do, people to see, places to go. But first, pausing for breath, taking long last looks around us and gearing up for the changes ahead. By pure chance we have had two very Rum-equse Fridays in a row the last two weeks and have two very mainlandy Fridays ahead. 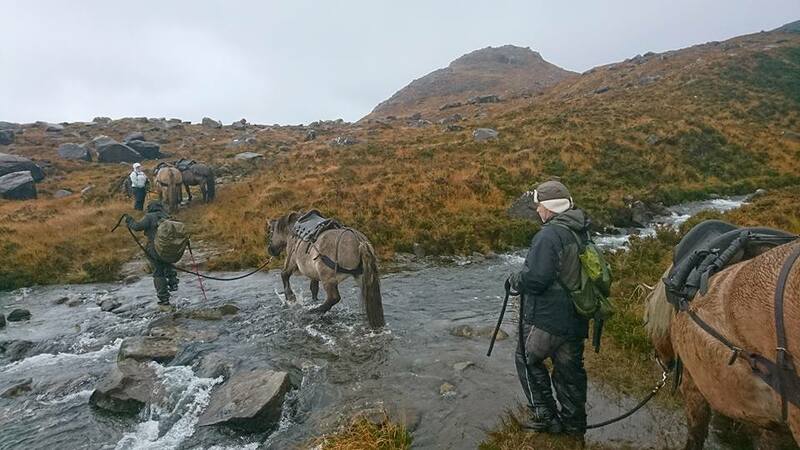 On 3rd November we were out leading ponies across rivers and up and down steep paths on mountains in the rain. 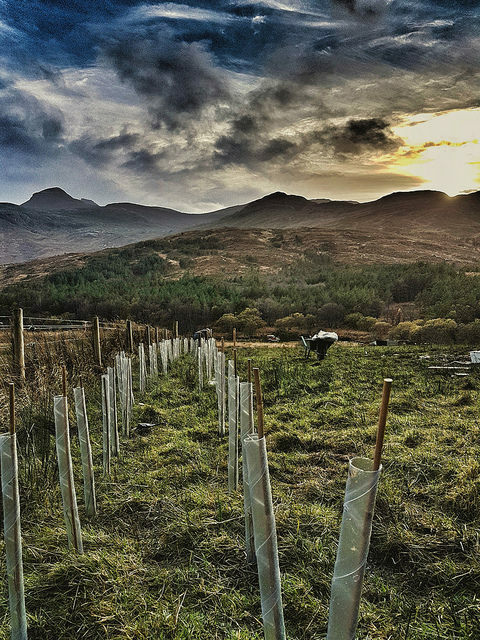 On 10th November the four of us were out on the croft all afternoon planting trees. 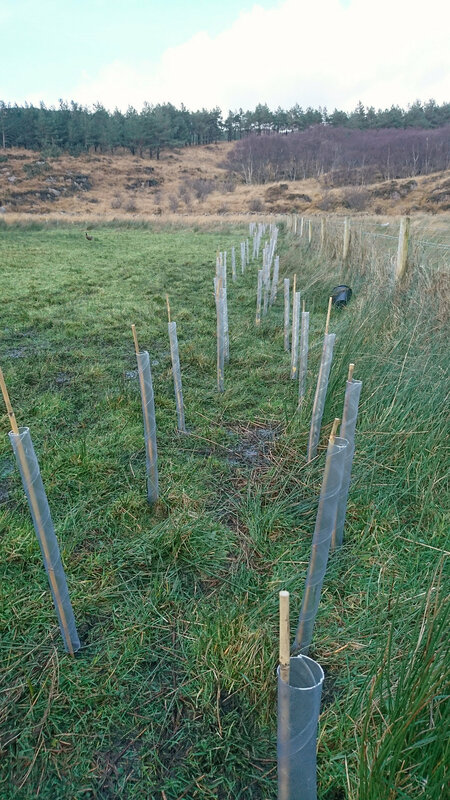 420 in total, bringing the total count of trees we have planted on the croft since we arrived here to over 1000. If everything goes according to plan on 17th November we’ll be driving almost the length of the UK from the Highlands to Sussex. I am anticipating traffic jams, road closures and diversions, the M25. We will leave the scenery and quiet of this life and head towards the busyness and excitement of the next chapter. We have a plan for the 24th which is even more at the other end of the spectrum but I’ll share that as and when it happens. Today Ady and I made sausages from the last two pigs we killed for eating. 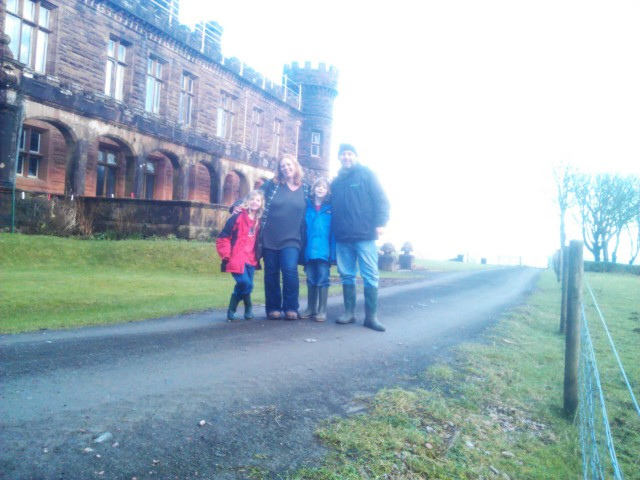 I’ve blogged before about our pig processing and how much we have learned. Seeing the whole process from breeding, birthing, rearing and killing the live animals, to the skinning, butchering and processing them. We have experimented with roasting joints, chops and diced meat. Used wet and dry cures to make bacon, created brine to make gammon, had an ill fated attempt at charcuterie products such as salami and chorizo and made sausages. Lots and lots of sausages. Sausage making is time consuming and requires some kit and additional ingredients. 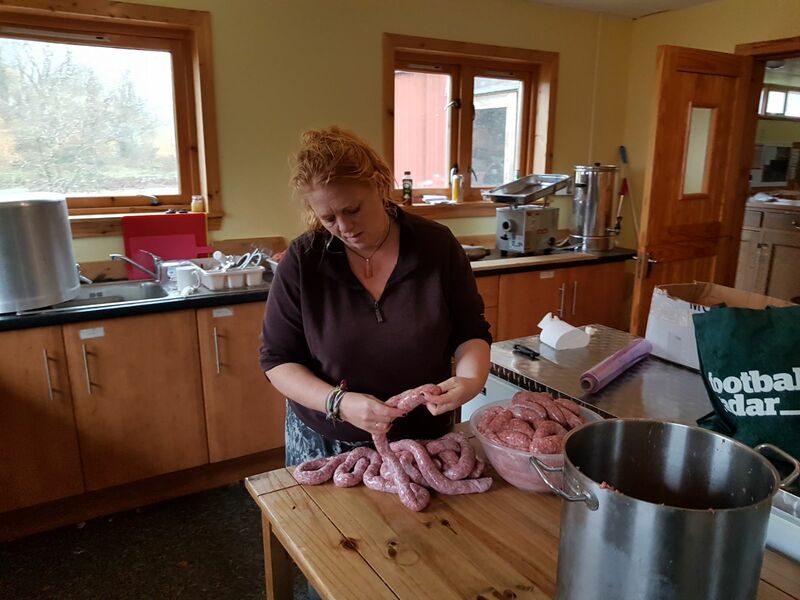 Given our lack of power up here on the Croft as well as lack of indoor, sterile and spacious environment we have always hired out the village hall space to make our sausages and made use of the community owned mincer and sausage machine. We did have a small hand crank mincer but it was a pale imitation version of the heavy duty ones from our grandparents days. We do have a small electric mincer with sausage stuffer attachment so in times to come when we are not processing an entire pigs worth of sausages at a time we will likely still experiment with our own blends of herbs, spices and flavourings and have another go at some of the more ambitious ideas which require certain specific conditions to work in or finish off in. As a child of the ’70s I have a much clearer recollection than Davies and Scarlett of butchers shops on the high street with strings of sausages hanging from hooks rather than pre-packaged polystyrene trays in the supermarket. We did patronise our local butcher surviving against the odds in Sussex but I think even he probably bought in his sausages rather than making them. I remember the hilarious attempts of contestants on The Generation Game trying to turn a huge stuffed sausage skin into a string of linked sausages. 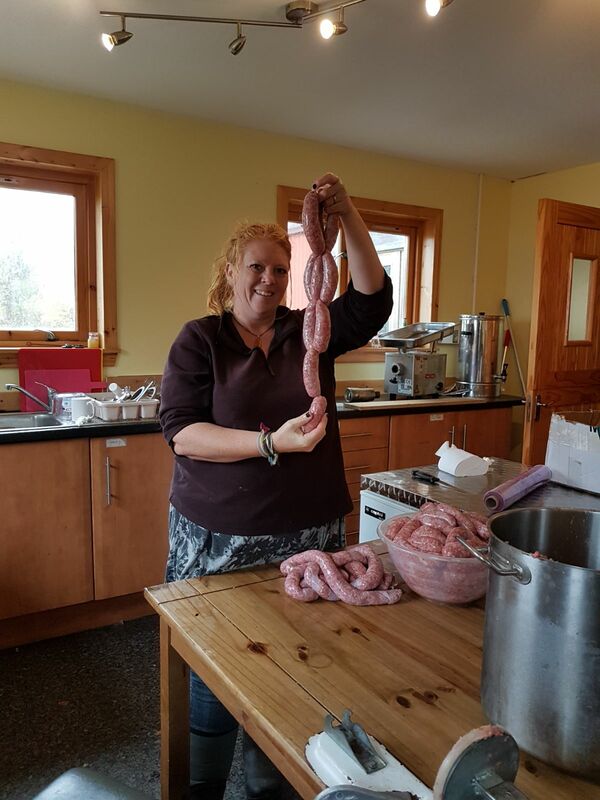 When we were WWOOFing we stayed with a farmer who had been butcher trained and could do an impressive link of sausages which the rest of us were only able to observe and vacuum pack as it was quite a skill. Ady and I joined fellow islanders in our first year here on a venison processing course though and while Ady retained far greater knowledge of the various cuts and butchering skills I have been deemed the Sausage Queen and am the one responsible for stuffing and twirling the sausages to turn them from one giant two metre long length to something while maybe not quite worthy of hanging outside a butchers shop certainly recognisable as a string of sausages. Sausages are something of an art, not just in the actual stuffing and linking but in the preparation of the sausage meat itself. The meat is best minced and processed very cold, if it’s not quite defrosted so much the better, which works well for us as the village hall is not being used to run a seasonal teashop during the winter and we usually kill our pigs in the autumn so we just need to work out the optimum timing for taking the bags full of chopped up meat out of the freezer to ensure it is defrosted but not too much. Previously we have erred on the side of not enough time and been hacking at raw pork ice lollies to get chunks off to mince. This time we allowed 48 hours and had frozen it in smaller quantities which turned out pretty much perfect. There is a huge array of choices available for herb, spice and flavour seasoning options and then whether to add rusk or not. After lots of experimentation our preference is for a fairly herby but not too spicy blend. This time I messed up by managing to order the correct seasoning blend but the seasoning only rather than the actual mix including rusk. D’oh! Cue some hurried purchasing of stuffing and sausage mix to aid in the bulking out. We could have gone with all meat and the sausages would have been fine but rather dense compared to our personal preference. Then once you have minced the meat, added the seasoning and rusk and water and re-minced it to fully blend comes the stuffing. We use bought skins (again not having the facilities to process our livestock sufficiently to get intestines to use) which need to be soaked in water to remove the salt coating used to preserve them. I have yet to get right the amount I buy either ending up with too many or too few. Today was a too few day and we only ended up with enough for about a third of the sausage meat we had. So 150 sausages made and enough sausage meat bagged up into the right sized portions for sausages for the four of us for another 300 sausages in the freezer. It is days like today which make me wonder whether it is living here like this which mean we dedicate a whole day for two of us to making sausages, having to curse and make do when we discover we have miscalculated the resources required rather than dashing out and buying more. Or whether it is living here like this which means we don’t simply pick up a pack of sausages or two from Tescos on the way home…. only time will tell. Either way I am delighted that not only will we be dining this evening on sausages made by us from pigs we bred here on Croft 3 but that there was a brief moment today with nearly 5 foot of sausages dangling below me when I could have hung them on that hook outside a butchers shop on the high street of my childhood and they would not have looked out of place. We’re in full on count down mode here with just over a week to go until we head off, assuming ferries run and any of a myriad possible happenings changes things of course. And the end of that last sentence demonstrates just how much Rum has changed me. 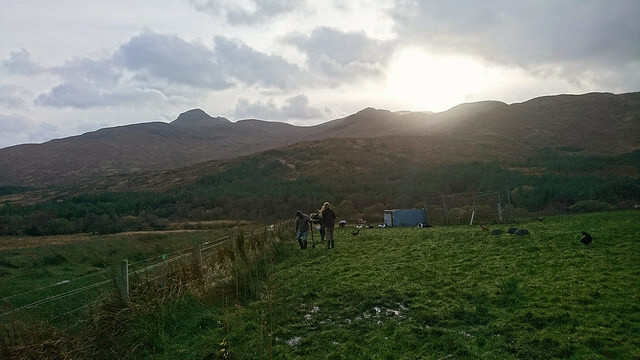 I’ve not been blogging so many of the logistical details of the pack up and shut down here as I did in the months leading up to our WWOOFing adventure although in many ways they have been very similar. I guess they didn’t feel quite so daunting this time around or worthy of documenting. I’ve also not been sharing the details of our plans – this is because they are still largely unformed. We know where we’ll be until Christmas but after that we are not sure. This is entirely deliberate as we need to check in with ourselves to see where we want to be. We have several firm options and a whole world of possible choices to explore more or think about. 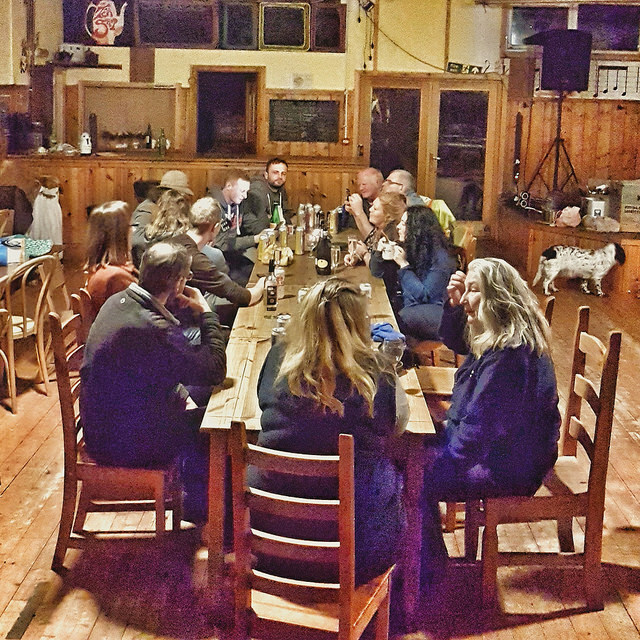 But the key reason for heading off is to work out what we want to do next and just as we spent time slowly working out what we wanted from life by testing out various possibilities when we were WWOOFing and travelling we are intending to do the same again before settling on the right location, arrangement and lifestyle. This means trying on for size and considering a few options and plenty of conversation between the four of us. 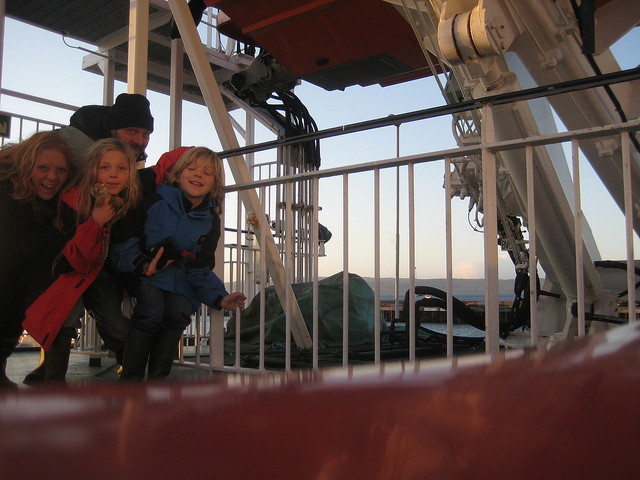 It’s a really exciting time with lots ahead of us – we are really looking forward to landing back on the mainland again and spending time with family and friends and are lining up lots of plans to see people, many of whom we have not seen since we left Sussex. We’re looking forward to seeing the opportunities that greater access to the resources the mainland has to offer and what that might inspire us to learn, to change, to get involved in. Meanwhile though we are saying our own quiet goodbyes to all that we love about Rum and the things which bought us here. 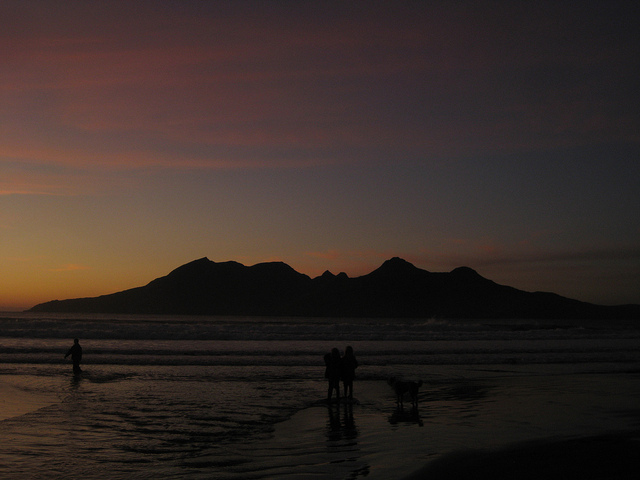 It was on Eigg that we experienced the sense of community living that most closely matched our own dreams of what that might mean. Various islanders collecting firewood and building the bonfire, various others smuggling over fireworks on the ferry (sshh! 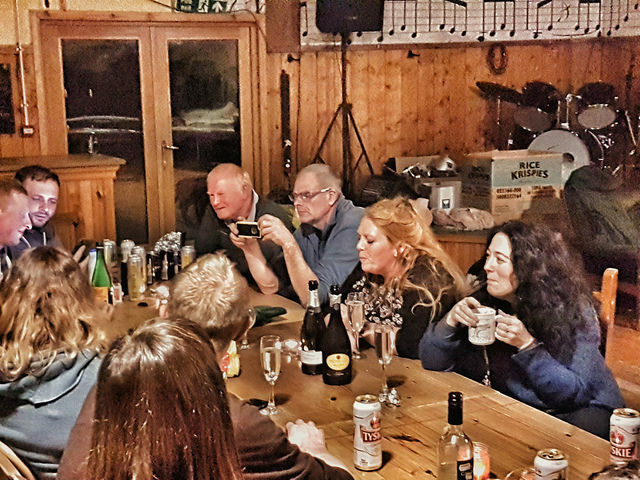 ), others letting off the fireworks, bringing round the mulled wine, watching the fireworks together and then gathering afterwards at the tearoom for drinks, songs and games of pool. It was that night which inspired us more than anything else to visit Rum and look at the croft. 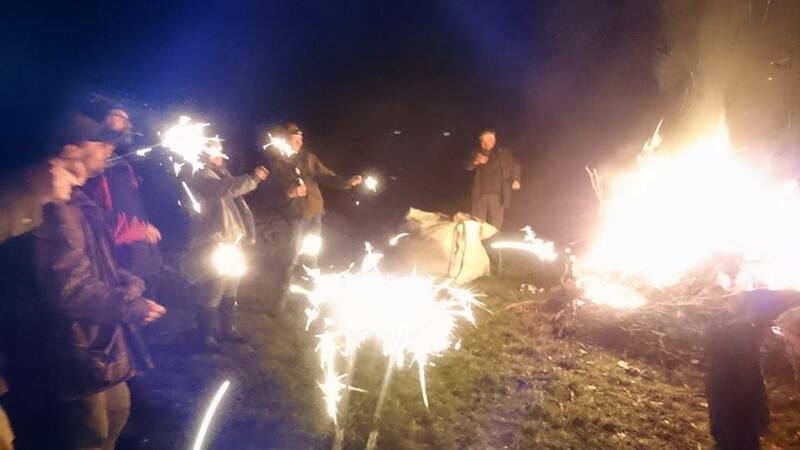 We’ve now had six Bonfire nights here on Rum. They have ranged from the first one where the weather postponed the event but because we were not contactable no one could let us know so we stood in the rain until someone drove along to tell us and then we walked home, passing Davies, Scarlett and Bonnie across a part of the path where the river had burst it’s banks to this years with easily the best weather we’ve had – a clear night sandwiched between two nights of pouring rain and howling winds as though it was meant to be. We helped build the bonfire, Ady hoisted the guy built by an island child atop it and then supervised another island child lighting the fireworks, I bought the mulled wine, Scarlett handed out the sparklers and we stood watching the most amazing moonrise while laughing and joking with fellow islanders who perhaps know us better than anyone else ever has having shared our whole lives with each other day in day out. I remember when we visited the island to be interviewed for the Croft walking through the village and looking forward to a day when we might walk with family or friends showing them the island and sharing it with them. Last week friends visited again – their fourth trip to Rum and we managed to again show them a new corner of the island they had not seen before. 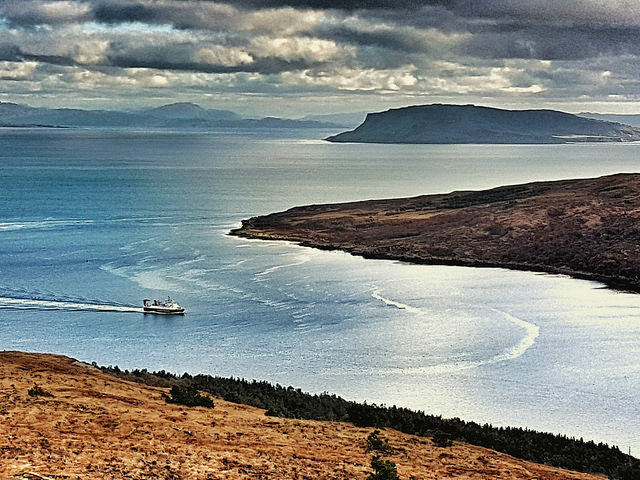 The first time we arrived on Rum on the ferry we realised how vast and largely unchartered Rum’s peaks and valleys were, with limited tracks criss crossing and strange sounding names on the maps. Some of those places are now familiar, others remain just names we have heard but in every direction I can see places we made memories. 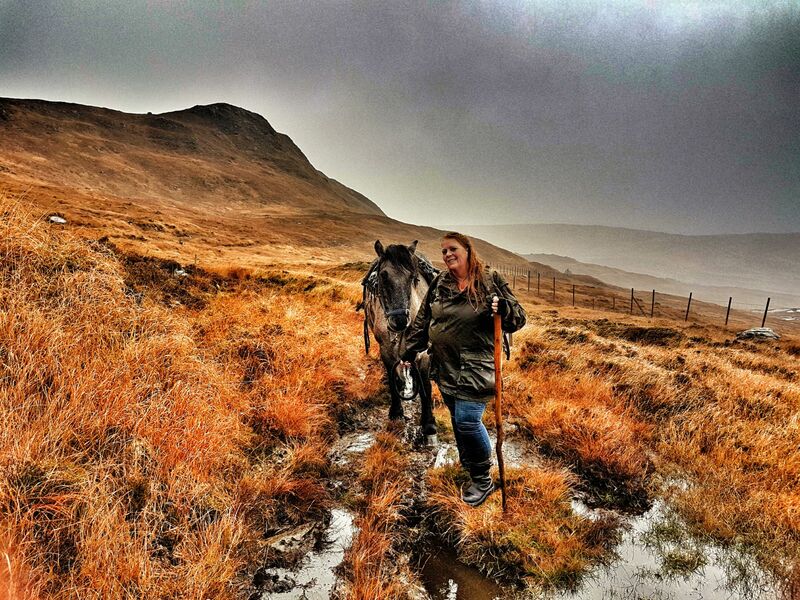 Last week I fulfilled one of my own personal wishes to head out with the ghillies leading the ponies into the wilds of the island. I only led a pony for a short distance but I walked out further than I previously have and have yet another tale to tell of life here. So amid the more mundane tasks such as ensuring we have a dog lead and seat belt clip for Bonnie in the car and a cat carrier for Kira, sorting out our clothes to see what we should / might take with us and trying to decide what justified a space in the rather cramped car we are also having our little moments with this amazing island we’ve called home.